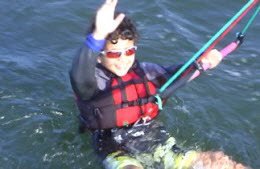 10 years old and no wake board or surfing experience: NO PROBLEM. In less than two hours on the boom Chase could put the board on and water start with ease; ride regular and goofy; and perform sliding transitions. By the end of the camp he had a rock solid water start and was thoroughly enjoying his first rides. Check out the video below. 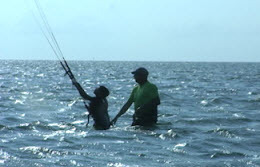 "I love kiteboarding! 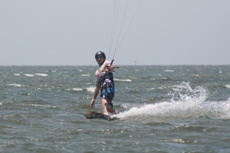 It's my new FAVORITE sport"
1st Month Riding after 2 Day Camp and 2 Mini-Camps - Riding upwind and toeside; performing slide and carving transitions; beginning chop hops and boosting (10+ feet). Add a little style to a carving transtion. And finish it off with a chop hop. 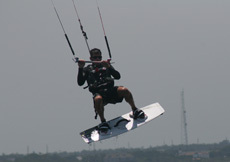 2nd season riding after completing the 2 Day Camp and 4 Mini-Camps - riding upwind (and toeside) effortlessly; performing slide, carving, and arial transitions; and boosting big - 20 feet. 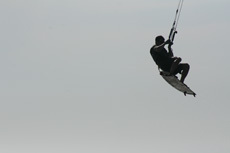 Riding toeside upwind... No problem. And of course, boosting BIG. 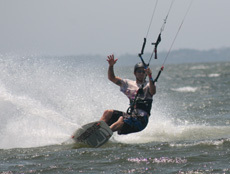 "I have to thank Captain Billy Stark and Cape Hatteras Kiteboarding for my solid kiteboarding foundation - everything I've learned has come quite easy since my initial lessons. 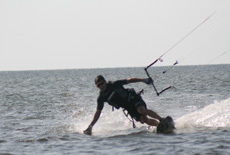 In one season I've mastered all the basics: water starts, riding upwind, toeside, transitions, and jumping. 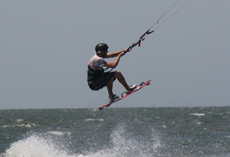 Now I'm kiteboarding confidently in 30+ mph winds and boosting 20+ feet! "